The accident happened at Pasir Gudang, Johor Malaysia, just west of Pulau Ubin. 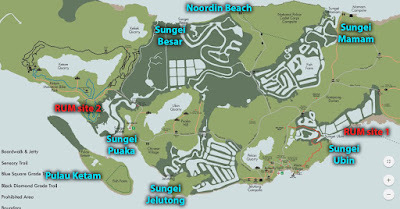 On Ubin, the shores that were badly hit included Outward Bound Singapore (OBS), Pulau Ketam, and northern shores around Noordin Beach. Some oil also affected mangroves at Chek Jawa. The bulk of Pulau Ubin's mangroves are in the centre of the island (by comparison, the mangroves at Chek Jawa are quite small). 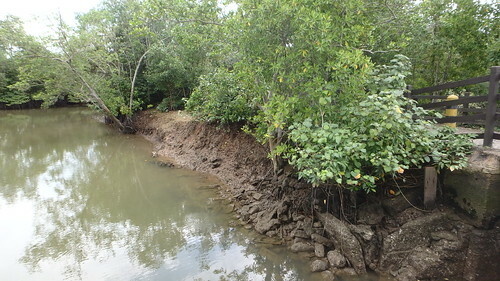 This Heart of Ubin Mangroves is fed by creeks such as Sungei Besar and Sungei Mamam in the north, and Sungei Puaka and Sungei Jelutong in the south. Pulau Ketam also has a lot of mangroves. So it was alarming for RUM volunteers to see oil affecting Pulau Ketam and flowing up Sungei Puaka and Sungei Besar. 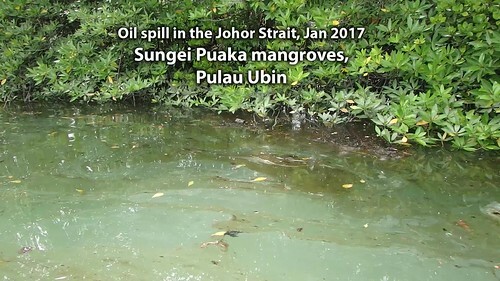 On 5 Jan, Phillip Lim showed how the oil was already impacting Pulau Ketam badly, with leaves and roots and trunks of large mangrove trees were coated in oil. And oil was flowing up Sungei Puaka. On 6 Jan, Phillip Lim continued to highlight the oil impact on Sungei Puaka. Photo by Channel 8 on 6 Jan 2017. Sharing with journalists what is happening in the Heart of Ubin Mangroves. Phillip Lim speaking to Channel NewsAsia on 6 Jan.
Phillip Lim's Sea Angel volunteers started kayak surveys of mangroves at Sungei Puaka. NG Siak Juay shared on 6 Jan : Oil Slick @ Pulau Ketam and Sungei Puaka, Pulau Ubin. Rachel Quek Siew Yean who is doing a documentary on R.U.M. for National Geographic came along to document the impact. 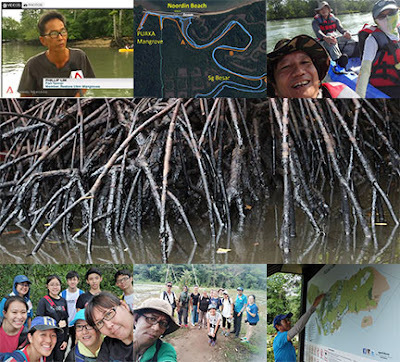 She shared: "On 6 Jan 17 (Fri), I was out in the sea (Pulau Ketam and Sungai Puaka) to survey the direct effects of the oil spill near Johor on the mangroves in Ubin yesterday. 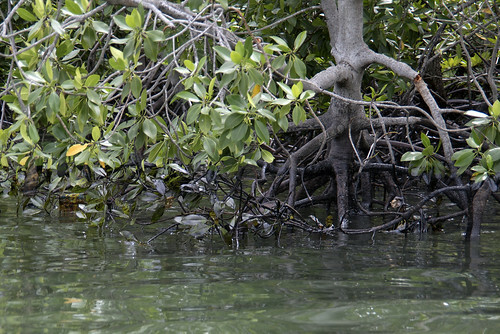 There were thick oil residue/gunk covering the mangrove roots and it is absolutely disgusting." Over the following days and weeks, Sea Angel volunteers continued their oil impact surveys in the Heart of Ubin Mangroves. with Phillip Lim's support for doing this kayak survey. 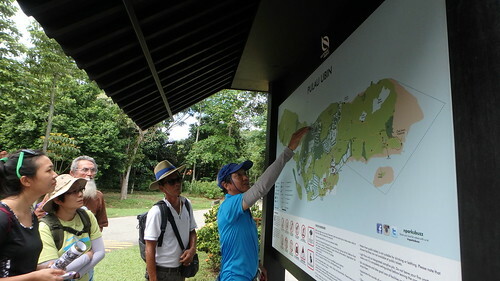 Ng Siak Juay with Phillip Lim on 8 Jan (Sun) surveyed the southern shores of Pulau Ubin. Noting a new boom across the mouth of Sungei Puaka which was not there since the oil spill up to Friday, it was possibly laid on Saturday. 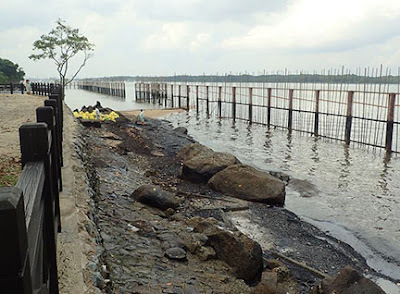 Ng Siak Juay shared: "10 Jan (Tue) - An Update - Northern shores @ Noordin & Mamam Camp Sites. Lingering oil will remain." On 14 Jan (Sat), an exhaustive survey of oil spill impact in the heart of Ubin's mangroves was done, gently by kayak. Thanks to NG Siak Juay, Victor Toh and Chan May Yen with Phillip Lim's support. The blue line is their survey route, with their comments. A) Noordin Beach / Puaka entrances. Slick most noticeable. B) First curve. Less noticeable. C) Second curve towards Noordin Bridge. Fewer slick observed. Among the sad sights seen were 'oiled' snails on a mangrove root. MORE photos by Victor Toh, showing the impact of the oil spill in the heart of Ubin mangroves. And the birds, animals and plants that depend on it. Including humans - the fish farmers. 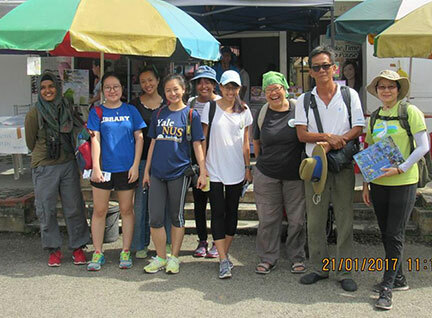 On 21 Jan, the RUMblers also checked Sungei Ubin at neap low tide and did not see or smell large amounts of oil. On 22 Jan, RUMblers checked RUM Site 1 and also did not see or smell much oil impact. Seeing that the area was clear of oil, they took the opportunity to also remove trash on the shore while they were there. 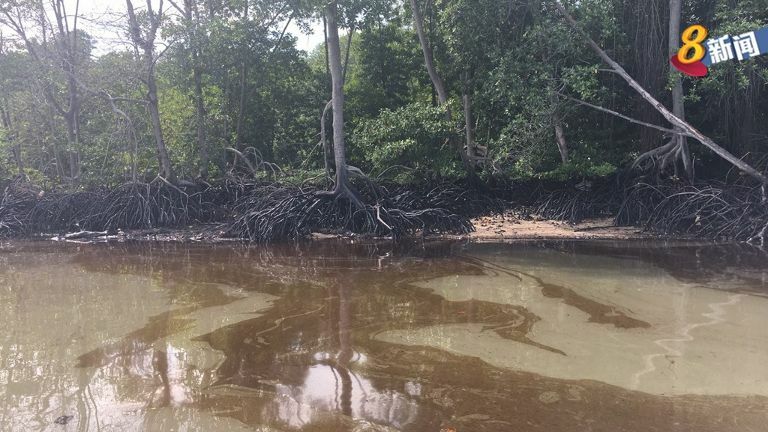 Lisa Lim shared: "This is one of the mangroves site that we regularly carry out cleanup activities that would also include removing drift-away fishing nets entangling the roots. These cleanup would help to better prepare site (for seedlings to naturally settle) for the restoration. We were glad to see that the site is generally unaffected as reports on other affected sites have been posted recently." Thanks also to Liz Lim for more photos about the trip and what they saw and did. Minister Desmond Lee also shared some of what happened during the oil spill and mentioned efforts by RUMblers during the oil spill. It was so heartening that many people signed up as RUM volunteers after the oil spill. 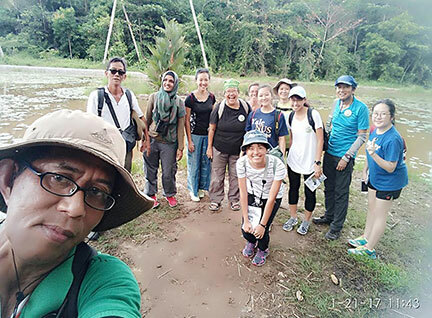 On 21 Jan, these new RUMBlers came together to for a field orientation to the free monthly mangrove walks done as part of R.U.M. outreach. Thanks to everyone for coming and to Uncle Lim of no. 42 Pulau Ubin for letting us gather at his shop as usual. It was exciting to have Rachel Quek with us too. 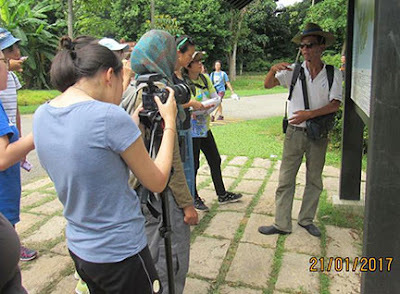 Rachel and her talented team are working on a documentary about Restore Ubin Mangroves (R.U.M.) Initiative for National Geographic! How fortunate that we met N. Sivasothi and Grant Pereira on our trip. Siva was a key advocate for Chek Jawa before reclamation was deferred. 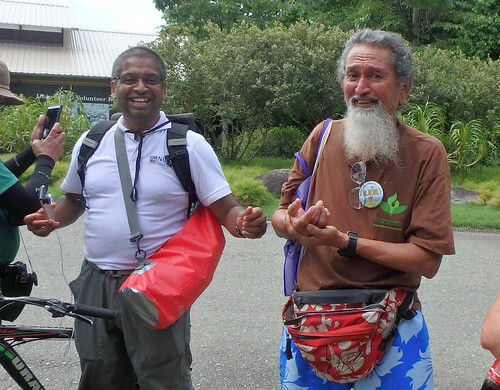 And Grant inspired and taught many people about Pulau Ubin with his passionate efforts there, including running Ubin Green House for many years and starting the first Ubin Day more than 15 years ago. It was great to have Ng Siak Juay share with the team what he had seen during his surveys for oil spill impact in the Heart of Ubin Mangroves. 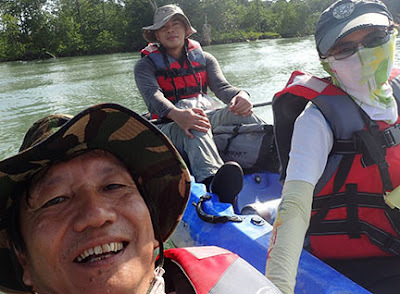 With RUM Site 1 (Sungei Ubin-Sungei Durian) on the horizon, Phillip shares more about the importance of mangroves to fish farmers that are found all around Pulau Ubin. As always, the selfie by Mohammad Juhari is the best part of the trip! Thanks to Ng Siak Juay for more photos about the orientation session. Thanks to Mohammad Juhari for even MORE photos about our trip. We are so encouraged that these wonderful people have stepped up to the R.U.M. free monthly mangrove walks. Check up the R.U.M. facebook page for updates on the walk. How are Pasir Ris mangroves and seagrass meadows after the oil spill? Are we helping or harming when we 'clean' oiled mangroves?